July 10 may be Tokyo, but it could also be other large Japanese cities such as Oaska or Nagoya. I still believe that a stop in Seoul is quite logical for ARA2. I think the question of where is the building in the picture of Yves Simard filming in front of the sign might be approachable via the logo on either side of the sign. It clearly says 4F on the bottom. What is above that is not distinct. It may be a hat on a person or on an animal. It's hard to tell. If anyone can blow that up and get a close look at it, it might yield better clues as to where that building is. To me it looks like an amusement arcade, of which there would be many in metropolitan areas of multi million population. If the dates are off, at least we have a start at fixing the relative order. I went back to Slowhatch's post of July 23 about Rotorua, in which he references two blogs about the Amazing Race at Hell's Gate mud baths. The first dated Friday 7/13 is not definitive about which day she actually went to Hell's Gate. You might assume it was the date of the blog, but that is probably not true. 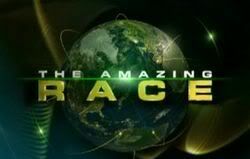 The second one on Saturday 7/14 is definitive about having been in Rotorua only on July 8, 9, and 10 (Sunday, Monday, Tuesday) and seen the Amazing Race at Hell's Gate. To me this makes it clear that the Amazing Race was in Rotorua on July 10. It therefore could not be in Tokyo at the same time! However Tokyo or another Japanese supercity could have been the next stop, as there was time to do so and still get to Prague by the evening of July 16. Or it could have been a stop before Seoul at the end of the race. Not only does this look like Korea, the caption says Amazing Race Korea. One level down there is a tag that says "Photos are from between 12 Jul 2007 & 16 Jul 2007". I guess that tells us when ARA2 was in Korea, probably in Seoul since there are only a few major cities in Korea and there is a picture of a very complicated rail or subway system that is likely to be for Seoul. Well fwiw this photo was taken just south of the Palackeho Most (bridge) on the west bank of the river just north of the Admiral Botel. It's about 1 1/2 miles away from the action at Hradcany square. What does it mean? If he was just doing a standup, zip . Slowhatch, Admiral Botel looks like a great place to have a pitstop. It has accomodations and food. As you know, regular TAR loves to have them on boats. I live in the Czech Republic and today I spoke with a taxi driver who participated at shooting! He told me that a group of Asiatic/Caucasian people and crew were acting 'How people find each other'. That was happening near Prague Castle (photos from Prague posted here were taken there) and after that they gone to Letnany Ice Rink. I have few contacts yet, so I hope that I can find out even more info. Yves' pics have been taken down. I think Michael McKay and/or Sony told him to take them down. Oh well. Last season, the teams were all quite nice people, this season they’re laying their true colors out for everyone to see. Some of the teams even wanted to start fighting with me! They’re very, very angry people! We’re going to have a special episode before the actual premiere of the first leg of the race. It’s called Racers Revealed and it gives the audience the chance to get more familiar with the racers before they actually start competing on the show. In that show, there’s a good chance they’re going to show some of these audition tapes so in the future, people will have a better idea of what it takes to be in the show. Actually, on the AXN-Asia site, people kept asking Michael McKay what they should put on their audition tapes, so instead of answering the same question, it's probably best to handle it this way. Yves' pics have been taken down. Thanks Kheva78. We'd love to come back to Jakarta and will certainly let you and all the fans know when we are coming. CabioTAR, I think the spoilers are a fact of life and don't really worry about them unless they are really spoiling the show for fans. I caught up with my friends from TAR this week and the new series promises to be sensational. The structure she's standing on was bugging me; it took a while but I finally found it: Fun Extreme Canopy, just east of the Visegrad citadel. One of Hungary's foremost tourist attractions and repositories of its cultural heritage, the famous Visegrad Castle. Visegrad Castle is a good half hour's hike uphill from the Danube. Its impressively large walls provide some incredible views of the surrounding river valley. The town of Visegrad is situated in a picturesque and strategic location north of Budapest at the bend of the Danube River. It was used by the Romans as a military fortress in the 4th century and became a Slavic settlement in the 9th century when they named it Visegrad, the Slavic word for "high castle." The citadel was protected by a moat carved from the rock and its Treasury Tower was where the royal insignia were stored. Visegrad Castle is about 25 miles directly north of Budapest, but maybe 30 miles by boat. OK, I'm reasonably sure of this photo, so I'll go ahead. Compare the tiles and battlements with this tourist photo. I think the soundman is standing on top of the Salamon tower, the lower part of the Visegrad castle. I've included the probable viewpoint below (original size source here). The red-roofed building in the background can be seen in the photos here and here.